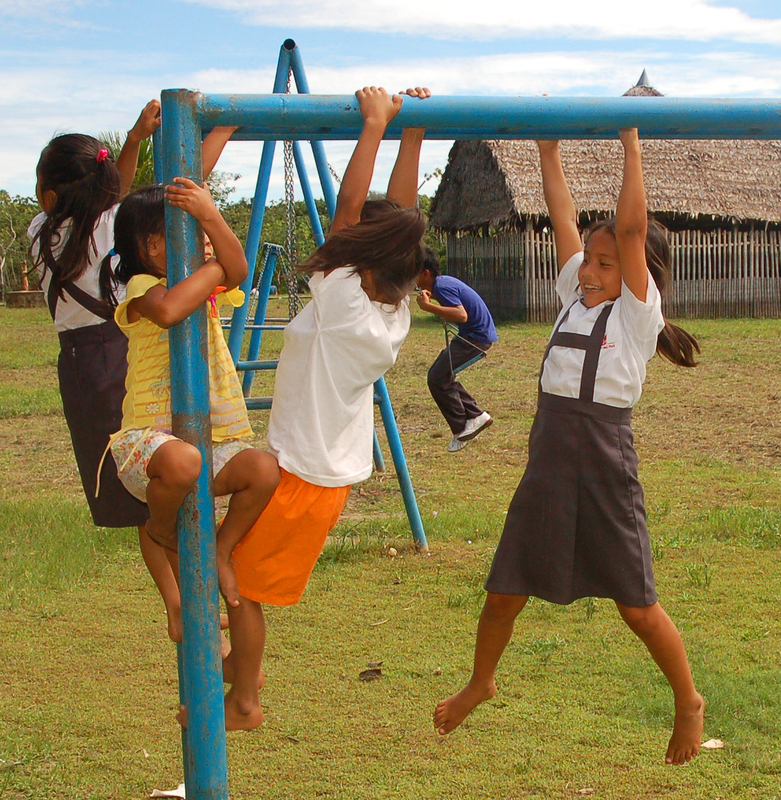 Every time I go to Peru, I look forward to spending at least a few days in the campesino village of Chino on the Tahuayo River. 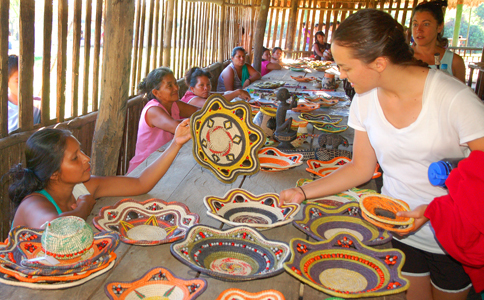 I go there primarily to buy some of the beautiful baskets and other woven handicrafts made by women in the Huacamayo artisan cooperative. 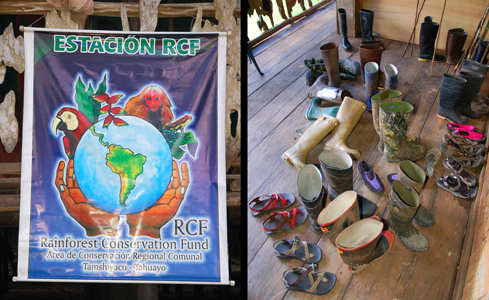 What makes these trips possible is that we enjoy an easy working relationship with the Rainforest Conservation Fund (RCF) to help arrange short stays at their lodge, meetings with artisans and leaders, and the purchase and delivery of materials for community projects funded with the CACE social rebate from craft sales. Finally, Chino is a very welcoming community in an incredibly beautiful place where I usually get to go fishing on a free morning. I have sometimes taken a small lancha from Iquitos to Chino (an 8 to 10 hour journey often shared with a boat full of people, chickens, fish and bags of charcoal), but Luke, Amrit and I were lucky that our friend Gerardo, an extension worker with RCF, was available and willing to take us there in their motorboat as long as we paid for the gas. While these trips are not guaranteed to be speedy (we once had to paddle the boat to a nearby village with floor boards when the engine conked out), we made it comfortably to Chino on this Tuesday without incident. The rainy season was over, but water marks more than a foot above the already elevated first floor on the walls in the RCF lodge showed that this year’s floods had been very high for the second year in a row. In past visits, I’ve share the four bedroom space with as many as a dozen students from Grand Valley University doing an Amazon field course with RCF President Jim Penn, but this time, we had the place to ourselves with Gerardo. The house is no luxury eco-lodge, but having access to a flush toilet, cold shower, gas stove, a generator for light and laptop, and a bed covered with a mosquito net canopy was a welcome upgrade after much more rustic conditions in the Ampiyacu. We spent most the next two days watching the artisans and buying their handiwork. 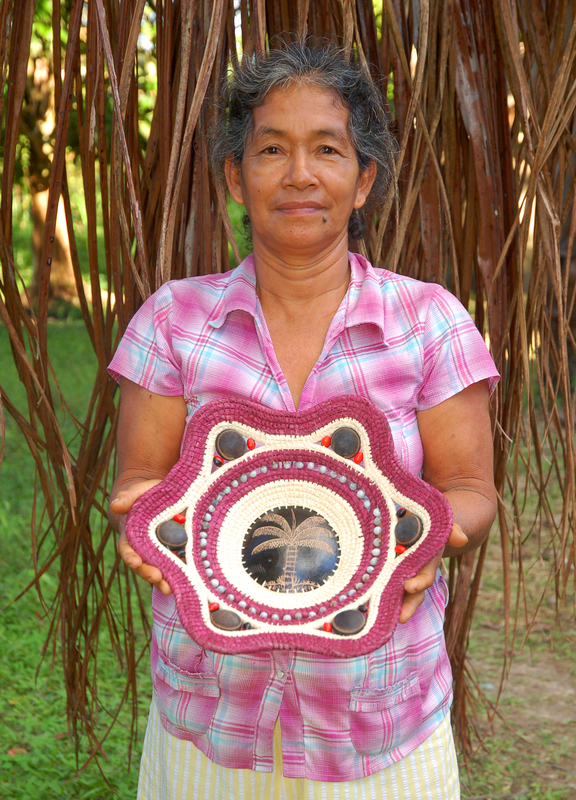 They have a well-deserved reputation for making a great variety of baskets woven with chambira palm fiber that has been dyed with a rainbow of local plants. I had bought many of these during past visits at a “feria” (fair) in the same simple building where coop members display their crafts to visiting guests from the Amazon Adventures lodge upriver. 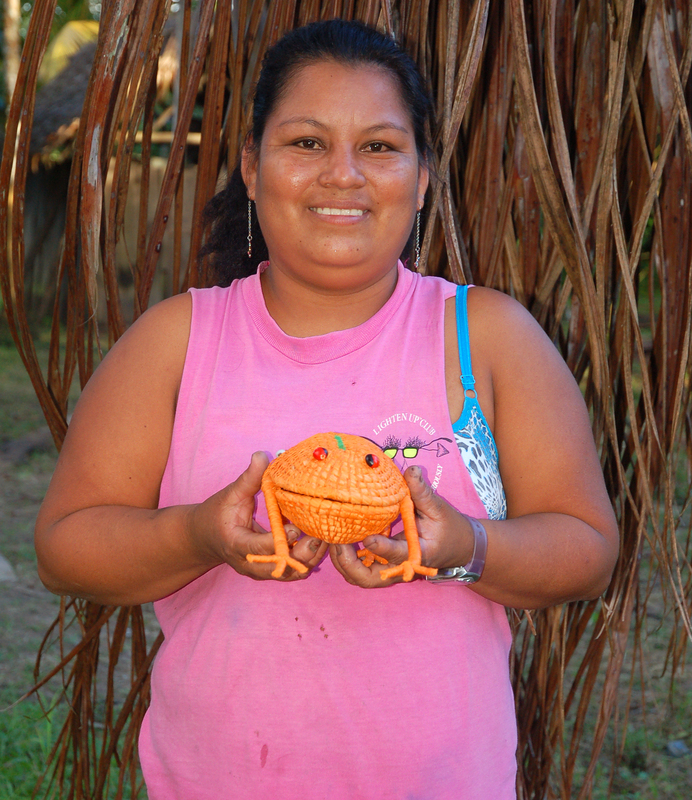 This time I had placed an advance order to buy dozens of woven frogs, particularly small ones designed as Christmas tree ornaments. 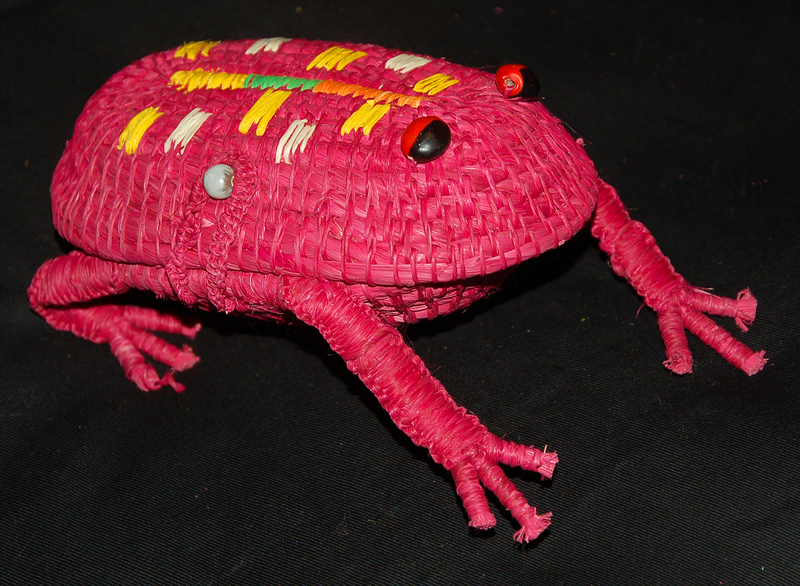 When arriving in Chino, I learned that my request for woven frogs had generated some confusion and discontent. 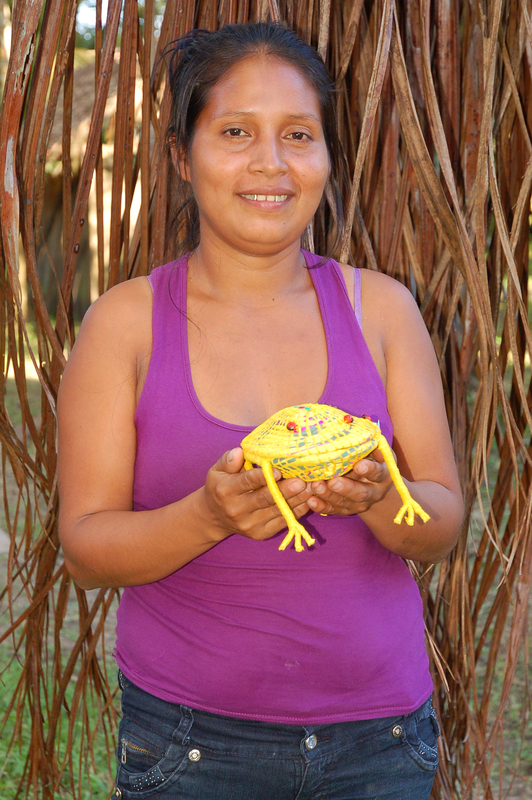 The cooperative had split the order among interested members so the benefits would not be limited to the one artisan who had specialized in the making these frogs in the past. This division led to a fountain of new designs for woven frogs including the neat innovation of well-defined feet. 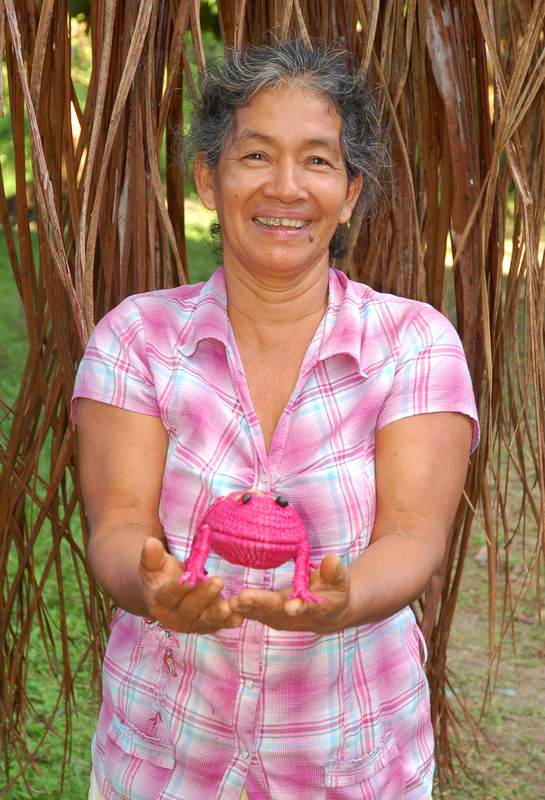 See other photos of artisans with woven frogs. 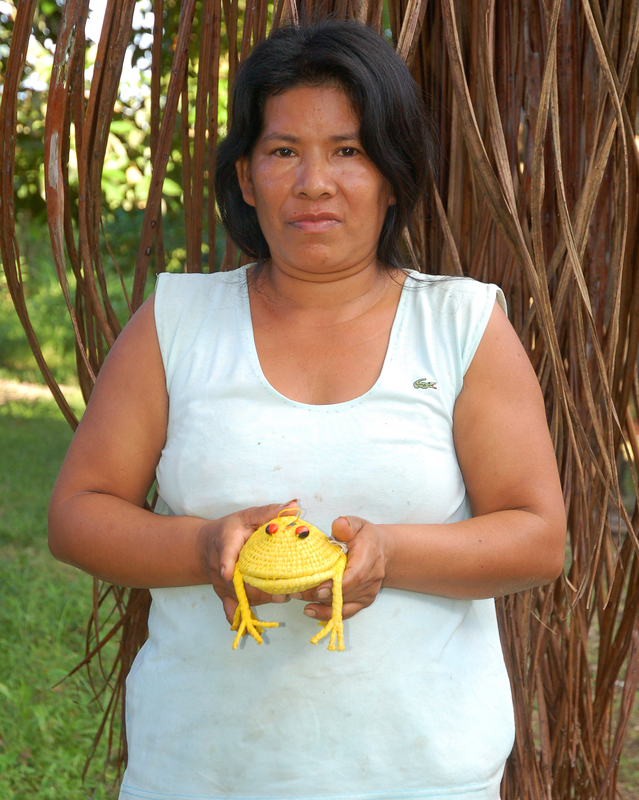 See photo album of Chino woven frogs on CACE Facebook page. Unfortunately some women did not make their first frogs with a pleasing shape or imbue them with the personality of their master creator. 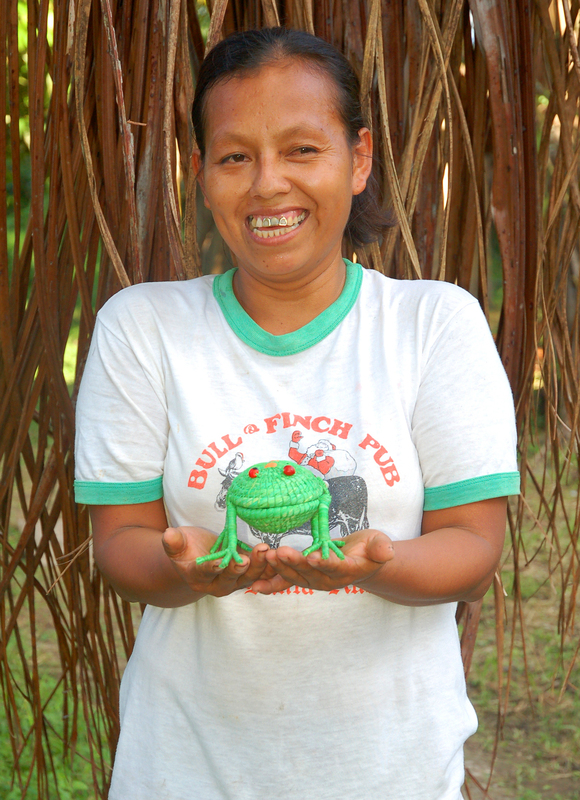 To compound this problem, the original frog lady had not understood the details of my order so she and her fellow artisans presented me with a squadron of larger than life bullfrogs and only one of the ornament sized peepers I had wanted as a tree ornament. I bought as many of the colorful mid to super-sized hoppers as I thought I could sell in the next few years with hopes that tourists would buy the rest in time. Few artisans left empty-handed, though, since I also purchased my usual quotient of 40 woven baskets and pots. The lesson for me (that I learned the hard way three times the hard way this trip) and the artisans was very clear. Handicraft orders should include very specific dimensions and photos of the desired models. It is wrong to assume that just because someone has made something one year that they will remember how to make it the same way the next. That evening I did a slide show of all the baskets I had bought from Chino since 2008 and gave a CD copy of these images to Exiles (an RCF extension agent who lives in the community) to share with other artisans so they could see and replicate some of the stunning designs they have made in recent years. See sample photos of Chino baskets. 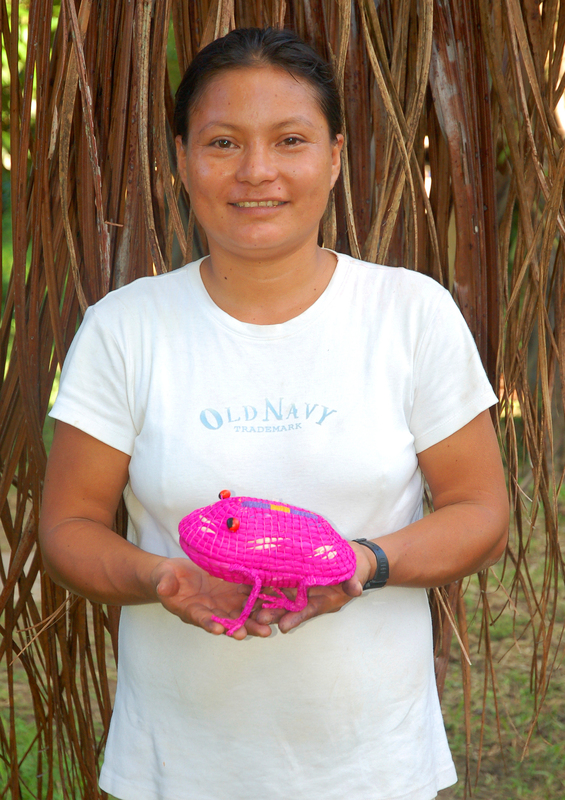 Chino artisans are also looking to expand their craft-making beyond weaving chambira. 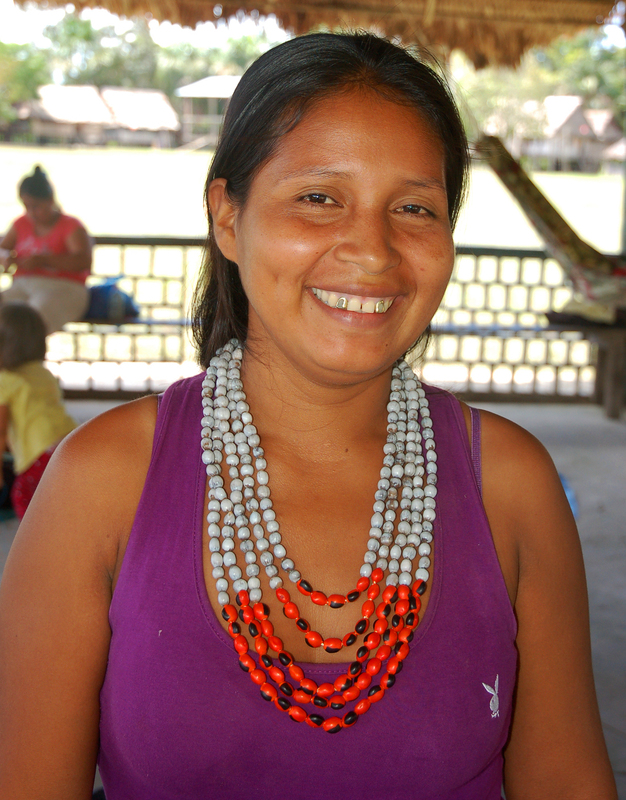 The day after the “feria,” most coop members gathered in the open-air common area (with a conical thatched roof) to practice making some complex necklaces with huayruru (Ormosia spp.) and rosario (Nothoscordum spp.) seeds. 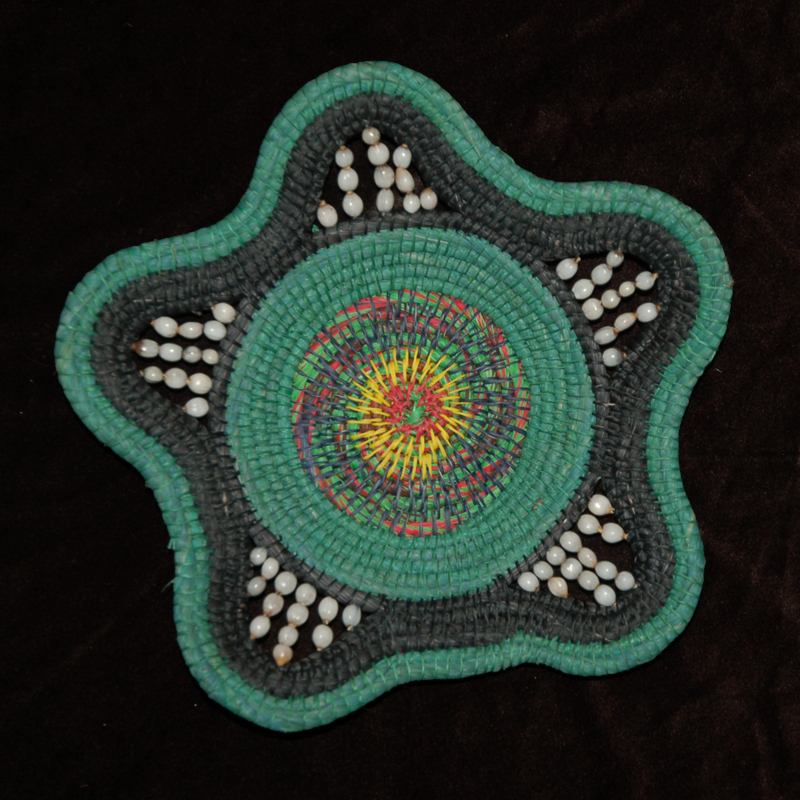 They used a hand drill mounted upward to drill a hole through the center of each seed and then strung them in patterns according to design specifications of a potential buyer. It was neat to see pairs of artisans working comfortably together to figure out the nuances of different models. Amrit attracted the attention of girls and eventually a few boys as she sketched women stringing beads and weaving bags. She admired one multi-strand shiny red, black, and grey necklace so much that she asked Rosa to make a duplicate for her. 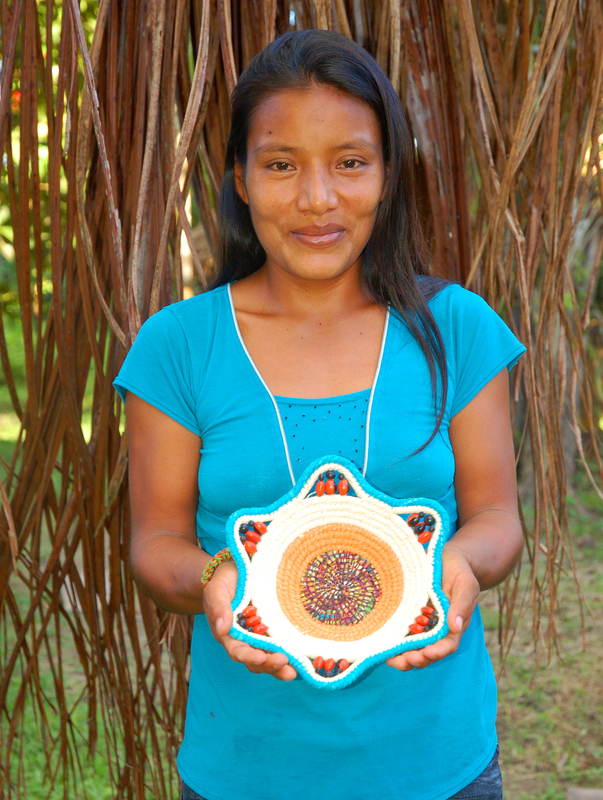 While most Peruvian artisans have many plants to dye chambira various shades of yellow, orange, red, and brown, it is surprisingly difficult to find green plants that can impart a durable green color to this otherwise receptive fiber. 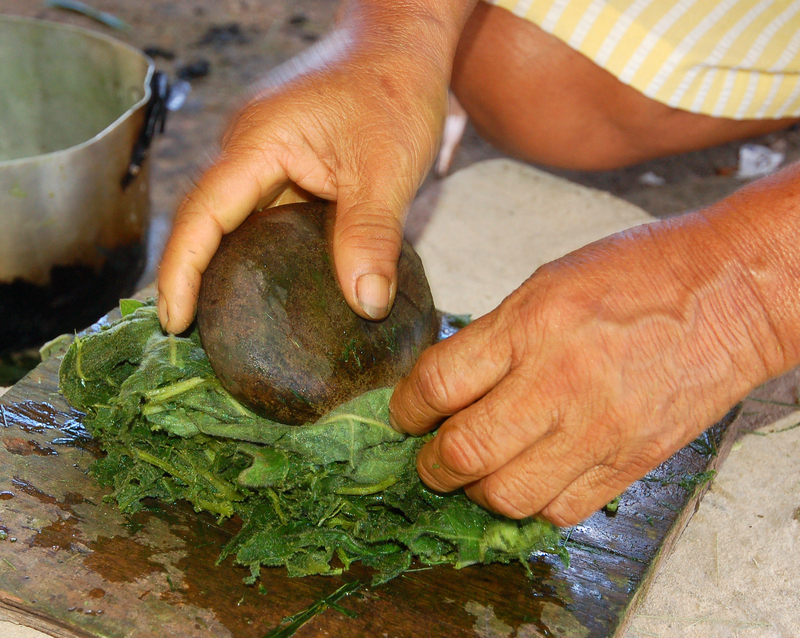 This visit to Chino, I was happy that two artisans left the necklace-making session to show me how they use leaves of pijuayo palm (Bactris gasipaes) and cocona (Solanum sessiliflorum) plants to dye chambira green. 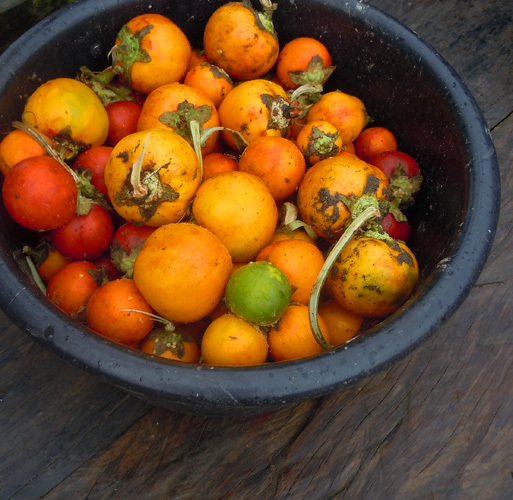 Both plants are common in home gardens and fields throughout the region, although their fruits are harvested more for food than dye. 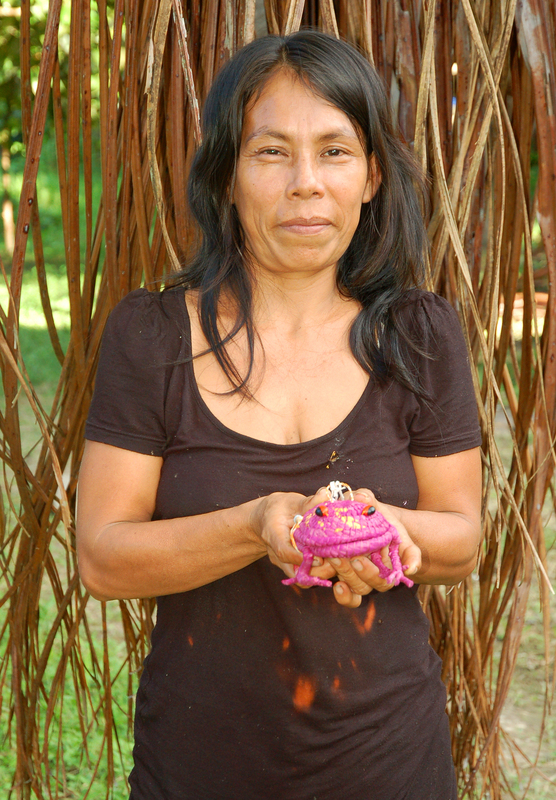 Artisan Romelia Huanaquiri who had demonstrated other dye plants to me before escorted us to her backyard and used a pole saw to cut a long leaf hanging out from a modest-sized pijuayo palm tree and plucked the spear-like leaflets off the petiole (stiff central stem of the leaf). 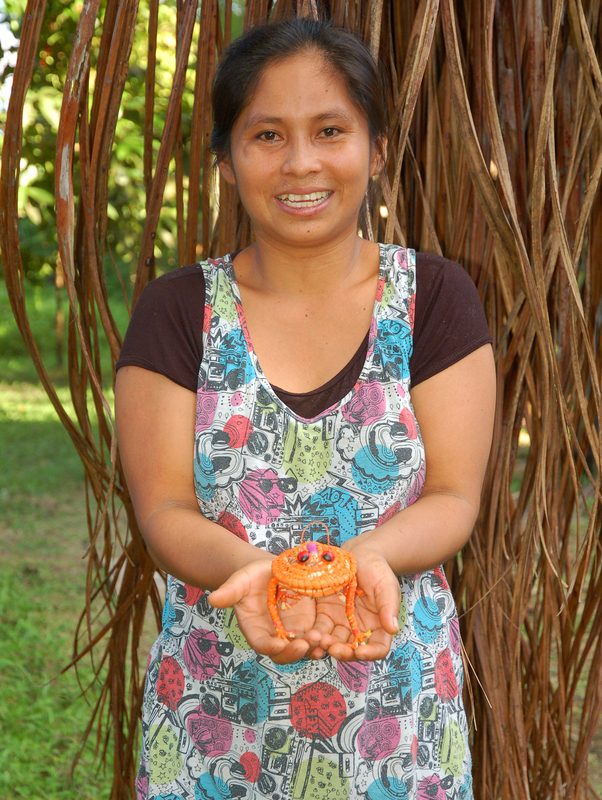 She then picked a handful of large plate size leaves from a cocona plant and brought them all back to her house. The next stages of processing both plants were the same. Romelia and her artisan colleague Lastemia took turns folding and smashing the leaves with a round smooth stone onto a large flat one. 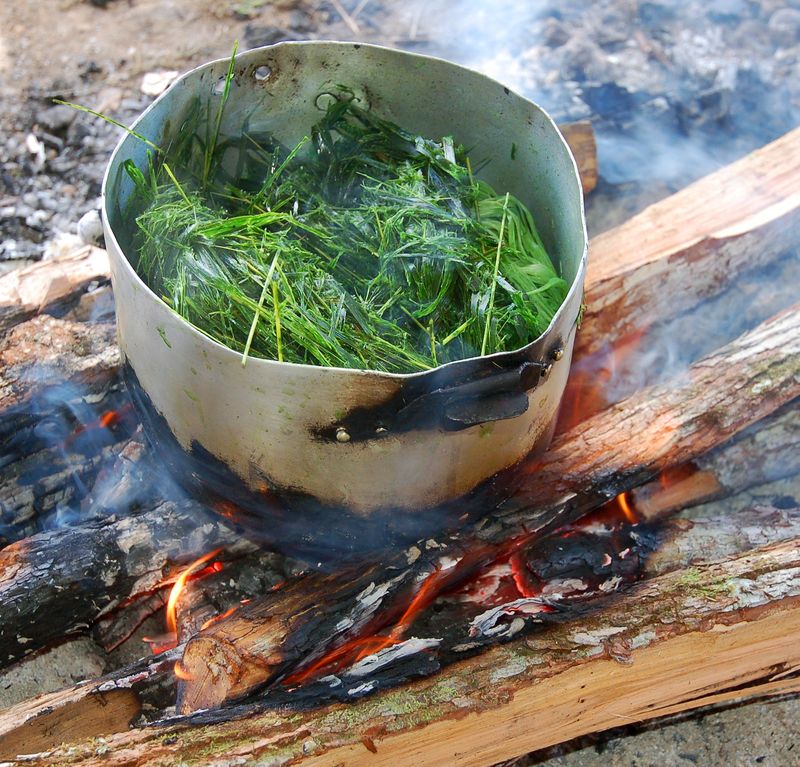 Each batch of mashed leaves was then put into a pot with some water and a hank of clean chambira fiber to boil over a fire. Romelia removed the pot from the flame after ten to fifteen minutes, sifted out the chambira, and laid the strands on a table to dry in the shade. The pijuayo dyed chambira had a pleasant medium green tint while the cocona dyed batch seemed quite pale. Romelia said that it had probably needed a stronger concentration of leaves and longer time boiling. 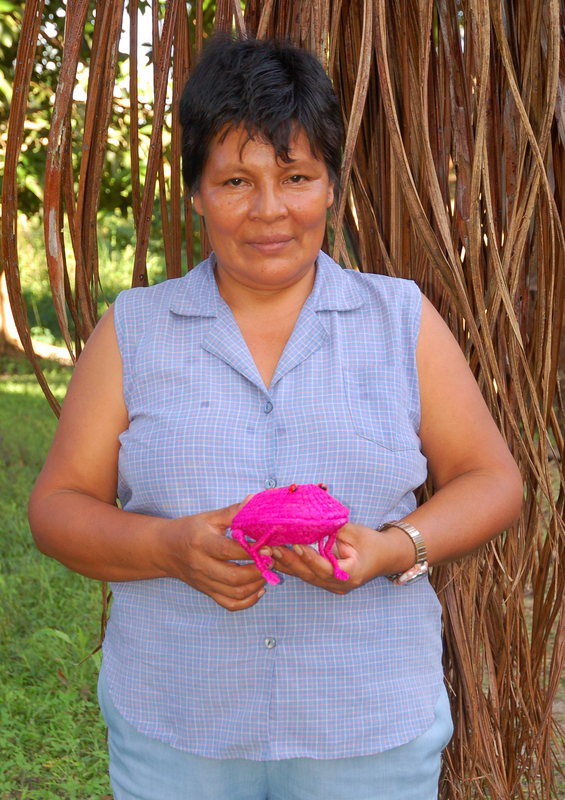 The main reason why Ampiyacu artisans said they didn’t use these plants was that the color in dyed in chambira faded too quickly if exposed to water or sun. We plan to do some controlled studies with these and other plant dyes to test their durability. 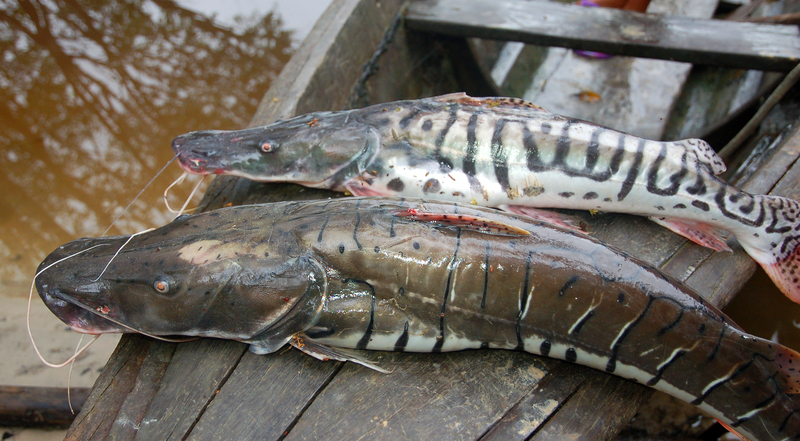 Luke, Amrit and I had a chance to go fishing with Exiles, but the best fish we had were from a couple of large striped (Psuedoplatystoma spp.) 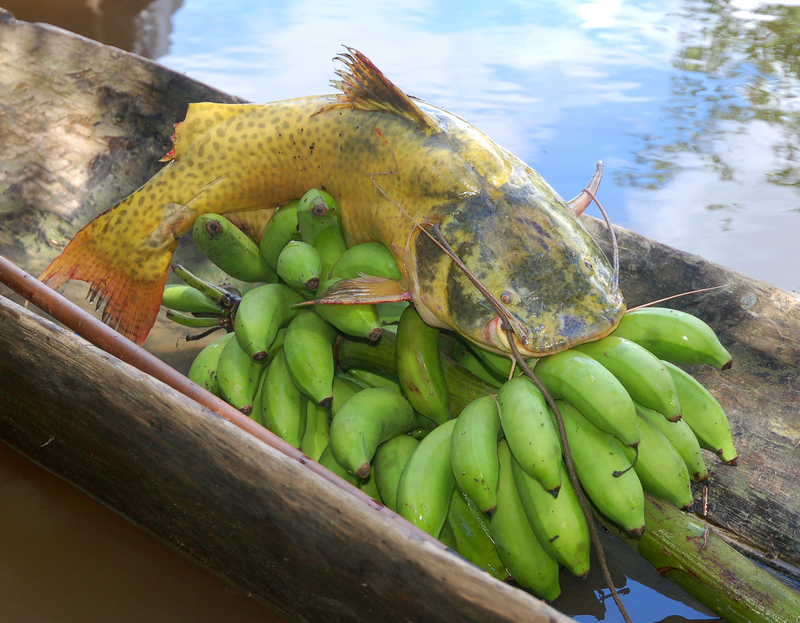 and yellow catfish that Gerardo had bought from a local Chino man who had been dropping his line in the water all night. 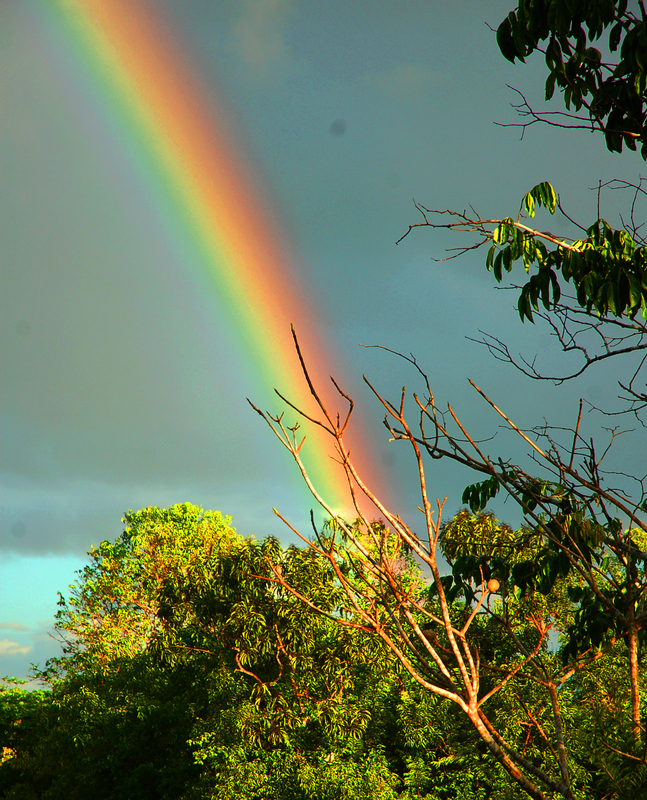 As we enjoyed our supper of fresh doncella, we were also treated to a gorgeous rainbow over the Tahuayo River. 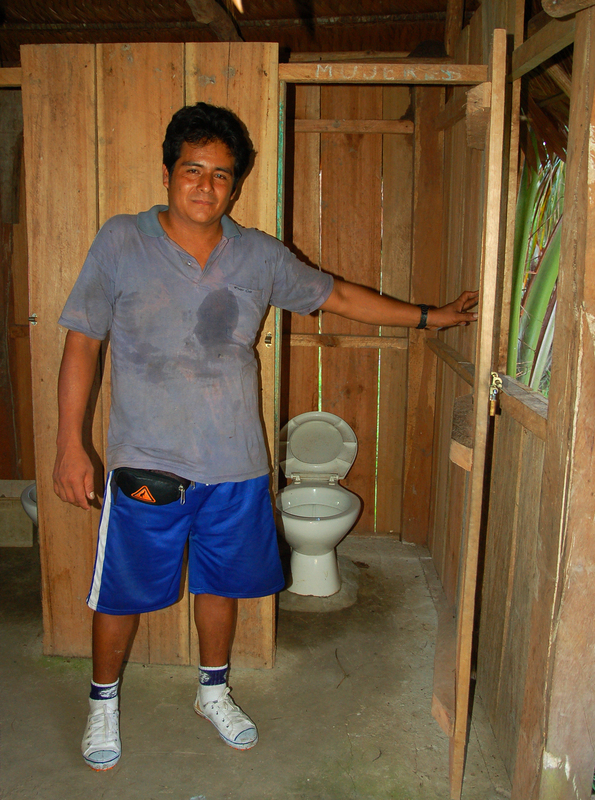 Last year, Chino had decided to use its social rebate funds from CACE sales of its crafts to build a basic bathroom for its school children. It took many months to complete, but I was very happy to see that the job had been done well. It was a two-stall wooden structure with basic toilets. A tube had been connected to the gutter from the school roof to funnel runoff water from rain into a large barrel that stood next to the bathroom doors. Kids would need to scoop water from this barrel with a bucket to flush the toilet. Luke made his own contribution to the kids in Chino by teaching English to the high school students for both days we were there. Teaching these classes in Chino and other villages was both inspiring for him and gave him an even deeper appreciation for the advantages of his education opportunities at home – benefits that many of his peers at his high quality public school take for granted. The community meeting convened to decide how to use CACE social rebate funds from the past year of craft sales was due to start at the typical time of 7 pm. While it was a convenient time to gather after work and family dinners, it also coincided with the peak dinner time for mosquitoes. As people casually arrived, the growing assembly resembled an unchoreographed jerky dance as people randomly swatted their shoulders and thighs and stamped their feet. Within half an hour, Solis Zandromo, the Agente Municipal (top elected official in Peruvian villages) felt that a sufficient quorum of residents had arrived to proceed. I presented a brief summary of CACE craft sales from Chino and the amount now available. Proposals came from the floor to carry out various projects, but the group finally reached consensus on a plan to build a cement patio in front of the school so the kids could gather on a dry spot that was often pure mud. If there were sufficient funds, they would also upgrade the school bathroom with a larger tank on the roof so the toilets could be flushed at any time with water pumped from the river because there were often times in the dry season when there wasn’t enough rain to fill the barrel. I passed around a bag of buttered and salted popcorn to the attendees with appreciation for their reaching a decision before the mosquitoes totally devoured me. 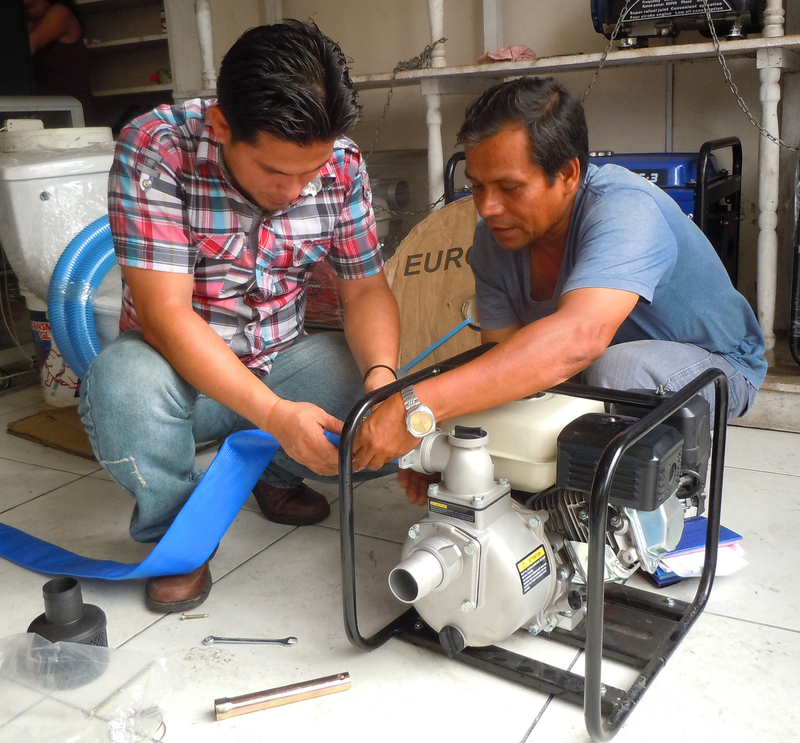 Back in Iquitos, Gerardo and Solis shopped around for supplies at hardware stores and quickly concluded that we actually had enough budget to finance both projects. 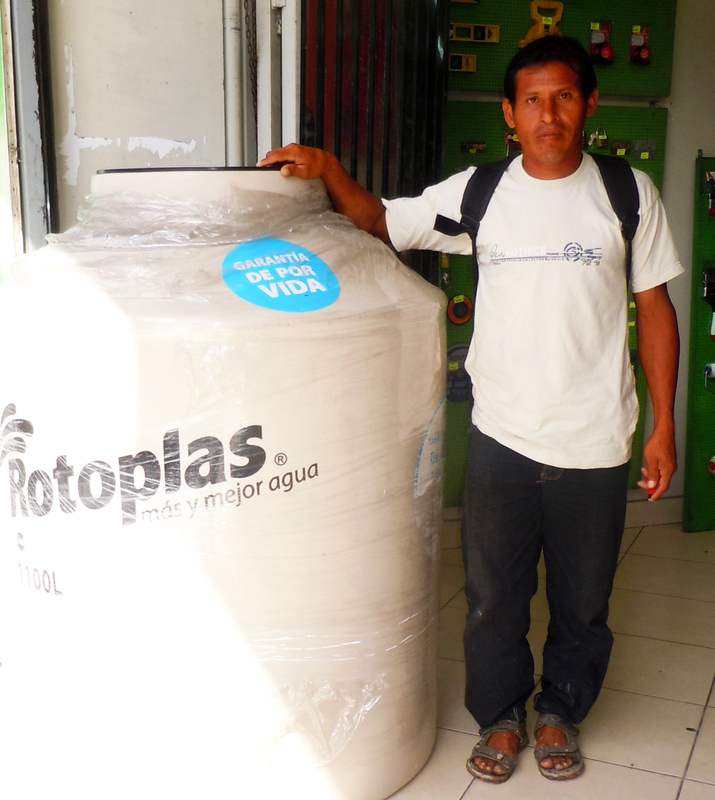 I didn’t feel a need to accompany them to buy cement for the patio, but it was fun joining them to purchase the giant water tank and test out the pump. I look forward to seeing the upgraded bathroom during my next trip to Chino in the summer of 2014. 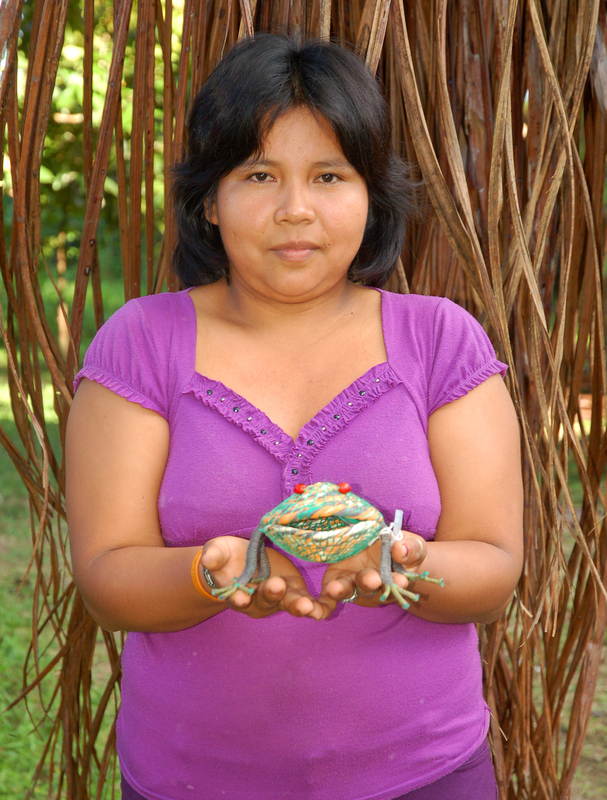 Below is a photo gallery of women from the Huacamayo Artisan Cooperative in the campesino village of Chino on the Tahuayo River in Peru who wove multi-colored small, medium and large frogs with chambira palm fiber for the Center for Amazon Community Ecology in July, 2013. 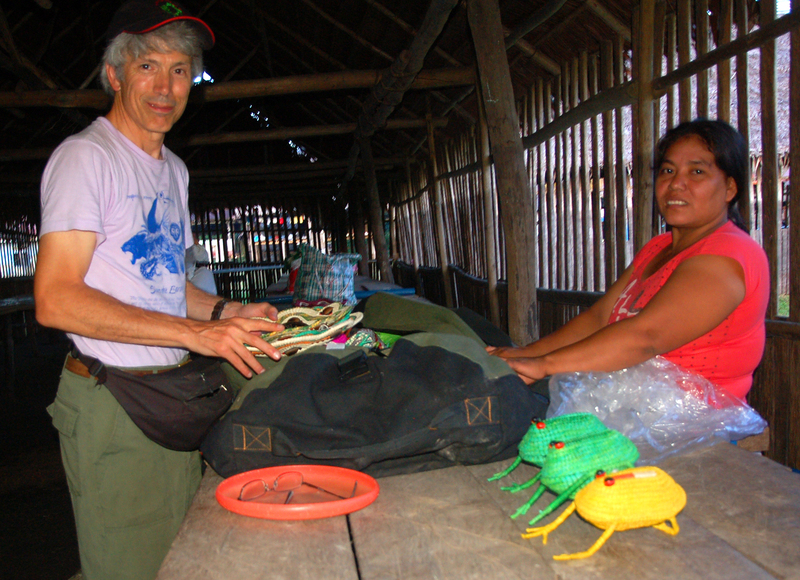 Contact CACE at info@amazonecology.org if you would like to purchase any of these items. See accompanying story and photos: A fountain of frogs and a new bathroom for children at Chino. 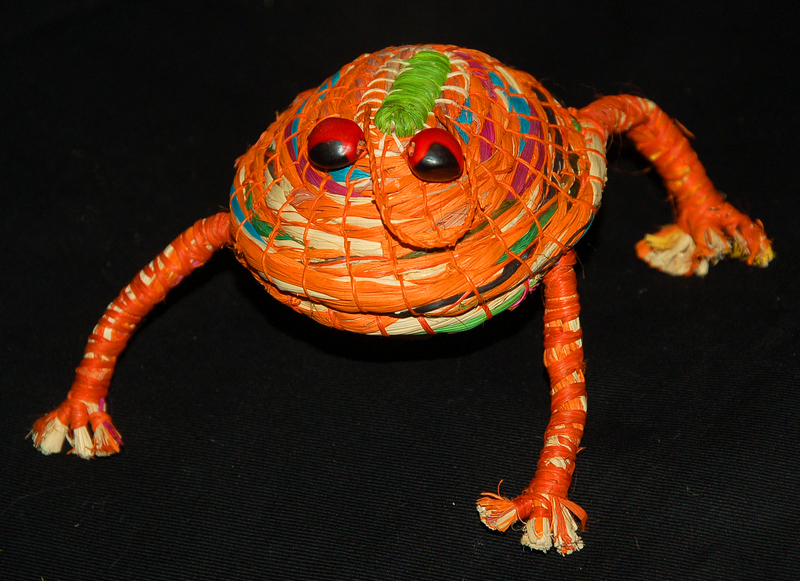 See photos of all woven frogs on CACE Facebook page. I had a bit of a false start getting to Chino. I had always gone there before in the speed boat belonging to the Rainforest Conservation Fund (RCF), but since it was occupied, I need to take a public lancha. Unlike the big ferries that carry up to 300 people and heavy cargo that are run by companies with a public office and phone number, some communities off the main rivers are lucky to be served by small “colectivos.” Yully accompanied me in a motor car that wove through the narrow streets of the Belen public market until we got to a small landing near the port. 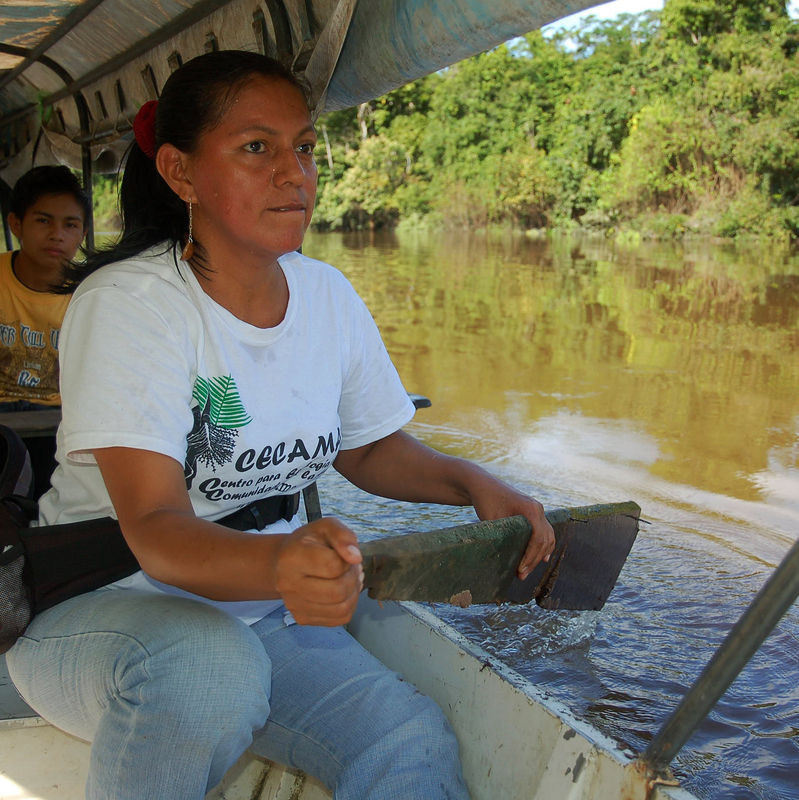 A water-taxi peque-peque took us to the boats bound for the Tahuayo River, but when we called out asking where the boat was going to Chino, the response was “there are none today, come back tomorrow.” Yully told me she’d heard that one of these boats had sunk here a few weeks ago. 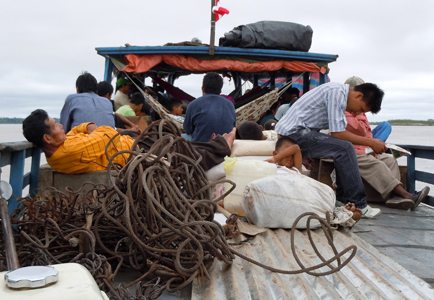 It was just coming into dock when a crowd of wholesale buyers swarmed on board to get first crack at the fish, charcoal and other forest produce the passengers were bringing from their settlements upriver. The surge of the extra human weight apparently tipped or outright swamped the small overladen vessel. Later than evening I finally spoke to one of my artisan friends in Chino on the only public phone in the community. Norma said there was no lancha leaving the next day for Chino either, but I could take the colectivo bound for Esperanza – a community downriver from hers where her husband could pick me up in his peque-peque if I could pay for his gas. Trusting to the fates, I returned to Belen the next morning and boarded the Guevara. I stripped off the mosquitero (mosquito netting), and strung my hammock across the beams in the middle of the lower deck. Swaying in comfort seemed preferable to sitting on one of the narrow wooden benches along the sides for the next seven hours. I put my duffle bag under me to give my bottom some clearance. Later arrivals had fewer choices as adjoining spaces were stacked with palettes of Inca Cola and other merchandise to stock little bodegas upriver. The trip proceeded slowly but tranquilly. I marked the location of a few larger settlements along the way for future reference with my GPS with names provided by a kind older man also going to Esperanza. I half-jogged up the hill during a half-hour break at Tamshiyacu to have some lunch at a three seater open-air restaurant. As usual, I asked the lady serving me to take off two-thirds of the mound of rice she’d piled on my plate and go easy on the noodles. As the number of passengers thinned out by mid-afternoon, I learned that the fellow in the hammock next to me was the husband of the woman who was the President of Mi Esperanza – the little company that organizes the production and sale of woven chambira baskets to the U.S. with the help of the regional government agency PROCREL. Sales had been really slow for a year, but as the economy began to recover, the buyer had placed another large order. Artisans in four villages from the Tahuayo and three more from other areas had just made about 700 baskets that were now being packaged and readied for export. A cargo ship would take them from Iquitos through the Panama Canal to Houston, Texas where they would be transferred to a truck for delivery to San Diego. The gift shop in the Museum of Natural History there was apparently the biggest U.S. outlet for these beautiful crafts. 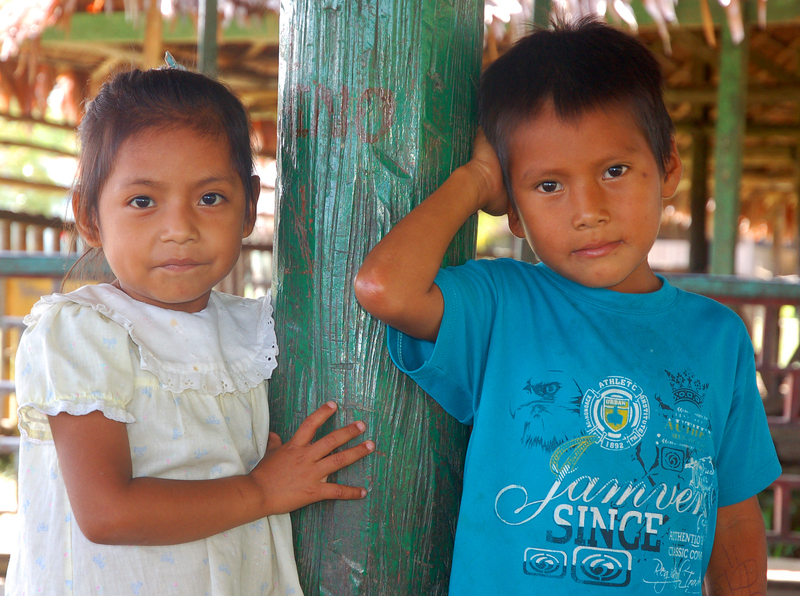 We arrived in Esperanza around 5:30 pm, and I was happy to see Norma’s husband Ezekiel waiting for me. I got in his 15 foot-long peque along with a family of four bound for a lodge just beyond Chino. It was a blessedly clear evening as we headed up the Tahuayo River. Our only stop on the way was the village of Buena Vista where I needed to get out and register with the local police – a requirement for all foreigners entering the Tamshiyacu-Tahuayo Regional Conservation Area. 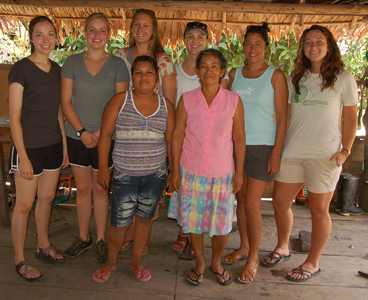 This formality is usually handled by a tour operator taking visitors to their “albergue” (ecotourism lodge). In the past trips, Gerardo from RCF had always been on hand to vouch for me. This time when I when I walked into the little police station and handed my passport to the officer on duty, he asked me instead for a copy of it. He showed me a book full of the photo pages of other foreigners and said I couldn’t go into the reserve without leaving them one of these to keep on file. I had a moment of panic since there was no photocopy machine within five hours of the place. I told him I had been visiting Chino for four years and had honestly never heard of this practice. He then asked me who my guide was, and I replied that I was on my own. My sincere explanation of why I was going to Chino and mentioning a dozen people waiting for me there, though, seemed to convince the officer I did not pose a threat to the communities in the reserve. He let me pass with the reminder to bring a copy of my passport next time. I was expecting to go directly to the RCF for a quiet dinner but when we arrived in Chino just before 8 pm, a party was underway in the public meeting space – a round open air structure with a conical thatched roof and cement floor. The community was feting the presence of Jim Penn, President of RCF, his group of a dozen students from Grand Valley University (GVU) in Michigan where he teaches geography, and a few other guests from the Amazon Adventure Lodge located a short distance upriver. A three piece band including two drums and a flute were playing lively Peruvian folk tunes while Chino women coaxed visitors to dance. I greeted Jim and was immediately offered a glass of “masato,” a slightly alcoholic beverage made from homemade fermented yucca root by Jorge – one of the village officers and accomplished carver. Jim and I made a plan for my quick visit and then migrated to a local pub with the students to enjoy a few beers. It was a welcome night out for them since they had spent the last two weeks doing an inventory of chambira palm trees in the community’s forest. This hardy group had suffered one casualty when one girl stumbled onto a fallen chambira trunk. Over the next two days, her comrades removed more than thirty sharp spines from her foot and legs. Buoyed with antibiotics and a tough spirit, she returned to the field three days later. 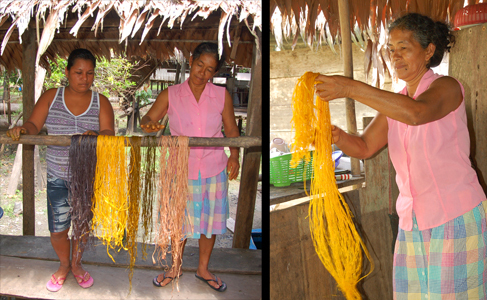 I spent the next morning of four of the GVU students at Romelia’s house in Chino watching her and her neighbor Rosa dye chambira fiber with three different plants. 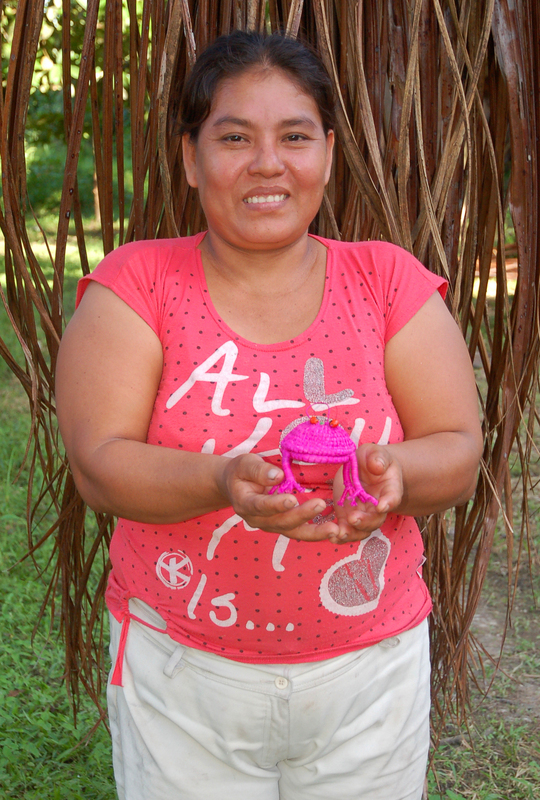 Romelia’s husband Jorge first climbed up a huito tree in their backyard and tossed down a batch of its fruits. 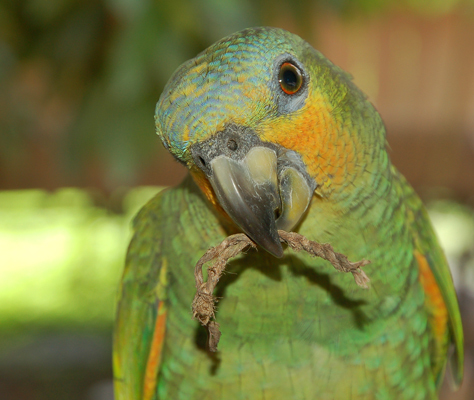 Romelia used her machete to scrape some bark from a cedro tree, but they were too dry to use. She and Rosa had better luck collecting pinkish shavings from an “ovos” tree. Afterward, she rubbed some mud on the wound to prevent termites from invading it. Oval scars on the trunk showed that she had been able to carefully harvest patches of bark for many years. Romelia said the ovos bark could be boiled to dye fiber or squeezed to release a liquid used to treat cuts and ulcers. 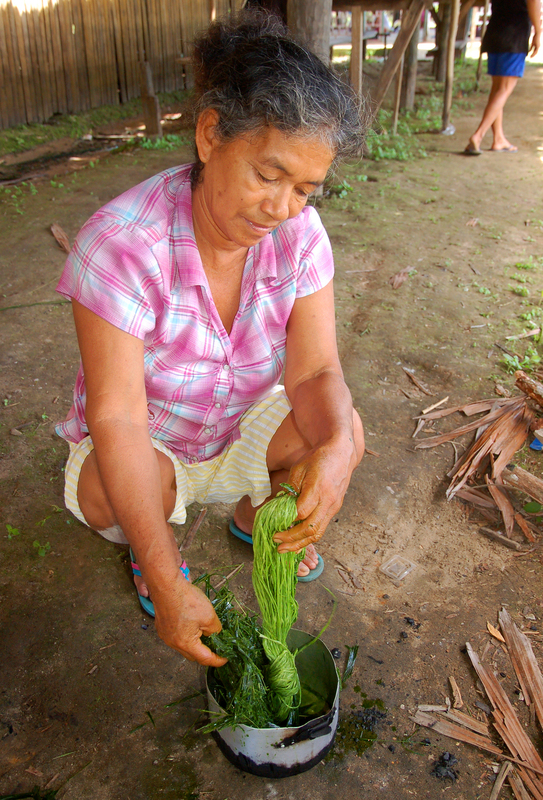 She then pulled up the last few roots of a surviving guisador plant. The prolonged flooding had killed the rest of these along with her cocona, pijuayo, and achiote plants. 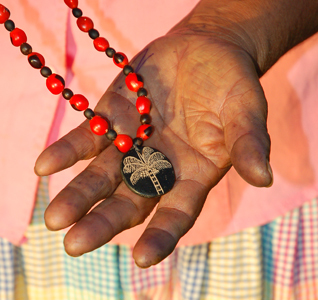 The guisador and cocona would recover in four to six months, but it would take three years or more before new achiote and pijuayo trees would grow back near her home. In the meantime, she would need to go to the higher forest to collect the leaves and fruits she needed to make green, red and orange dyes. 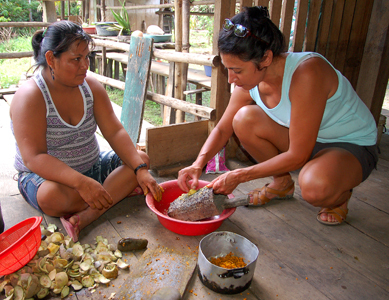 Rosa and Romelia then sliced, grated, and pounded the fruit, roots, and bark they had collected with some help from the GVU students. They put each batch in an aluminum pot and boiled them with a handful of chambira for five to fifteen minutes. The guisador turned its fiber a deep golden yellow, the ovos produced a dark red, and the huito turned its chambira black. Romelia added some fresh guisador to the water from the huito batch and boiled it with some fresh chambira to dye it a dark green. When each batch reached the proper shade, the women took it off the heat, washed it, and then laid the strands over a wooden post to dry in the shade. Laying them in the open sun could dull the color of the newly dyed fiber. 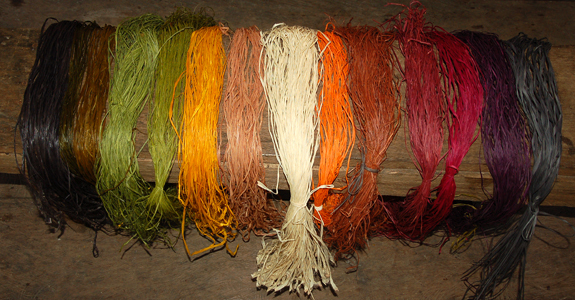 When these fibers were ready, Romelia and Rosa each brought out samples of the other colors they had made with other plant dyes including achiote (orange), cumaca (brown), huacamayo caspi (pink), mishkipanga (purple), and huitillo (dark grey). 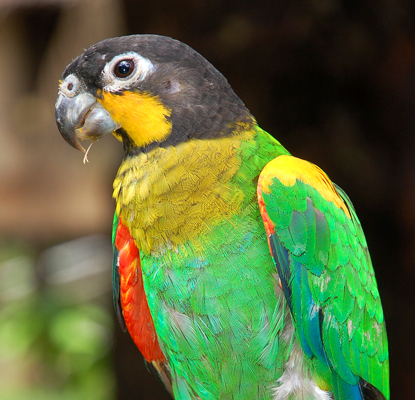 It was a morning of earthly rainbows with diverse colors of chambira, skin tones, and feathers of Romelia’s parrots. 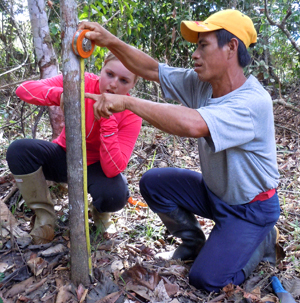 After a quick stop at the RCF lodge to gear up, the whole student group and local materos went back to Chino to survey chambira palms for a few hours. I joined a small team with Lilly from GVU and Ezekiel (Norma’s husband who had driven me to Chino the day before) to record the number of leaves, position and condition of these spiny palms in a large area of purma (secondary forest) where many of the village artisans harvest the cogollos (leaf spears) to make their baskets and other crafts. Periodically my lead pair would also measure the height of a water mark on a tree in our survey area. The flooding didn’t seem to have killed adult chambira trees. Intensive harvesting in this area, though, hadn’t allowed much natural regeneration, and a number of the few young palms we found were dead or dying – apparent victims of the high water. I appreciated the chance to join this crew since it gave me ideas about ways to improve our own chambira surveys with the Ampiyacu native communities. 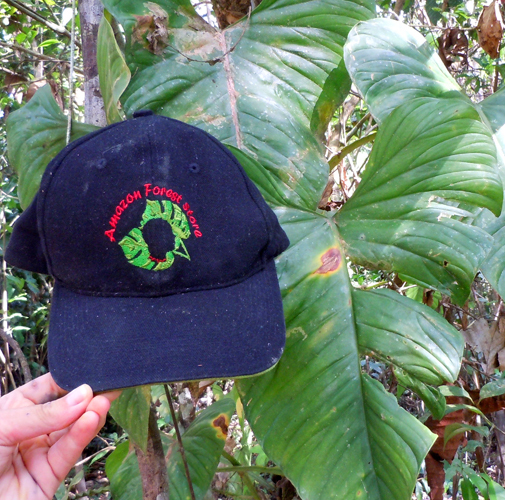 I also got a kick out of seeing a climbing vine whose large leaves were similar to the Philodendron leaf on the Amazon Forest Store logo of the Center for Amazon Community Ecology. My task for late afternoon was shopping for baskets and other crafts in Chino. Most of the members of the Huacamayo association prepared a “feria” and laid out their wares from their designated spots behind two long tables. I made one quick round to greet every artisan and missed seeing a few of the regulars who were occupied in their field or away from the village in Iquitos. I laid a little white tag in each item that I definitely wanted on the second round, and added a few more to my purchase list on a third time around. The whole student group then arrived to buy a few things for themselves (usually an inexpensive bracelet) or gift (usually a nice basket) to bring home to their parents. When the students were done perusing, I took a picture of every artisan (or sometimes their daughter) with the crafts I had bought from them. 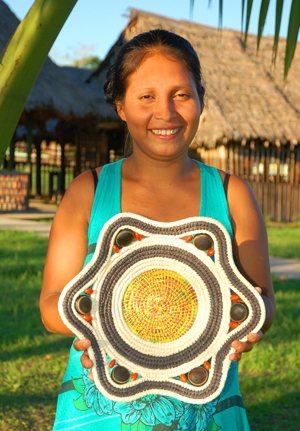 These shots give me a nice record of the evolution of the basket designs and the chance to offer people who buy the baskets a photo of the woman who made it in this little Amazon village. As the sun started going down, we went back into the “feria” building and gathered a table for a crash course in speaking English to tourists at a “feria” – an event that happens every week or two when Amazon Adventures brings a group staying at their albergue to visit Chino. I covered the basic greetings, phrases like “How much is that basket?, This basket costs……” and the numbers for the most common prices for their crafts. As expected, a few of the women were painfully shy and too embarrassed to voice our strange-sounding tongue in more than a whisper. Most gave it a valiant effort, and a few showed real potential for connecting with visitors who often spoke little or no Spanish. They all said they would like to practice these things more. When my class ended, the GVU students were wrapping up a volleyball game outside. We then all went to the school where a few of them led a longer class in basic English with about fifteen kids and a few curious adults. They wrote lists of greetings, terms for family members and numbers on the blackboard. Their students dutifully copied them all into their notebooks and repeated them back to the guest teachers. The GVU students then spread around the room to encourage more direct speaking and listening practice with groups of two or three kids. This energetic group finally called it a night after two hours although they clearly wanted more sessions like this. They had all studied English from a little book, but so welcomed the chance to practice it with friendly native speakers. Back at the RCF lodge, it was sort of a night at the movies. Someone had been a tasty batch of popcorn, but my talk about CACE’s work with copal resin and handicrafts was the main attraction. We didn’t have an LCD project on hand, but we managed to get all the students a little closer to a screen by showing it on two laptops spaced apart on the dining table. I got a couple of hours of sleep on a pad in a one-person tent Jim set up for me in the living room and woke up at 3:30 am a few minutes before my watch alarm went off. I finished packing and brushed my teeth while the night time frogs were still peeping. Gerardo emerged half an hour later and took me to the Sanchez lancha docked next to Chino. I said a quick hi to Norma who was going to Iquitos with her daughter, strung my hammock from rafter to rafter and went back to sleep. I needed some rest after a busy day and a half in Chino.